This blog has been very very queit recently (well for a good long while actually), but its back. Travelled the world (well a bit of it), went down under to NZ, OZ, Singapore and Hong Kong. Cruised around Europe in our campervan. Bike related stuff can be found at but other non bike stuff will be here. http://www.itsalljustridingbikes.co.ukis where the action is. All of the following come from the illegible scribblings in my notebook. Flight was alright, vaguely OK movies, not enough food. When breakfast was served people were ready to eat their young. Land only to find Mike's bike missed the flight. We're assured its on the next flight. Slowest moving queue ever at Alamo but we are back in BC and we have a massive Van! Drive up to Squamish along the Howe Sound, its as beautiful as ever. The food and beer at the Howe Sound Brewery was as good as last year. Pitchers of Honey lager - start as you mean to continue. By the time we get to bed we have been up for 27 hours. I'm up early, like stupid early, like 3am early. After vainly trying to sleep and then just listening to my iPod in bed I'm up and I'm out. Watching the world go by over a XL cup of coffee at 6am in Tim Hortons in Squamish sees a procession of Canucks in trucks coming past the drive through. A kid in a hockey helmet complete with facemask is sitting in passenger seat of one of the trucks, how he's going to at his donut through that I'll never know. More coffee and Timbits sort breakfast for the people back at the hostel. Our day is spent hiking up the Stawamus Chief granite obelisk, which is just as hard/fun as last year and a trip to MEC in Vancouver for "essentials". Japanese in Squamish, Mike and Jude are unconvinced about the merits of raw fish. I rented a Norco Six Full suspension Bike an had a great time playing on the trails I stick mainly to the Blue runs as I could do without breaking myself on the first day of riding. I still manage to remove a nice patch of skin on my left forearm. highlights were the new trails Crank it Up (full of berms, tabletops, wallrides and a fun box) and Angry Pirate (techy steep singletrack with a couple of "North Shore" sections). We stay in Lillooet, in a motel that I'm sure is from a slasher flick. 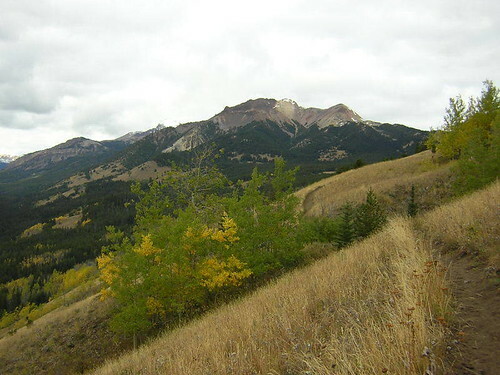 Today we drive from Lillooet to Golden. We pass through Kamloops but we mainly spend the day driving a staring at the scenery. Shorter drive from Golden to Canmore. 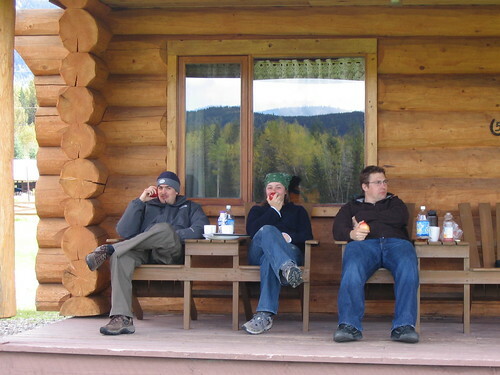 We stop at Lake Louise and hike up from Lake Louise to Lake Agnes and stop at the Teahouse at the top, which is run by students and by the sounds of it pretty much everything is carried up there. We have dinner at the Grizzly Paw brewery, best chicken wings ever and really good beer! We drop the girls in Banff, which is 20 minutes from Canmore, and they head off on their horse riding trip. 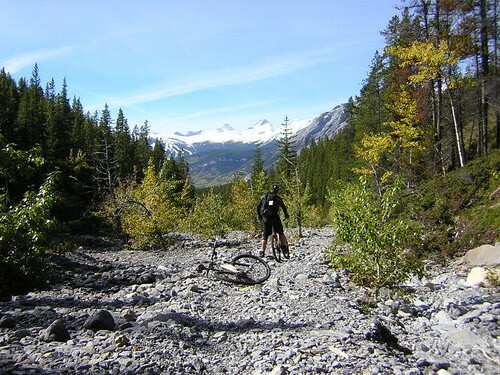 Mike and I sort out a accommodation in Banff in double quick time and get set for our first XC ride of the trip on the Rundle River Trail, its an out and back ride 8km in each direction off road and is a bit of a wake up call as its very techy and is a mass of rocks and roots. Still its nice to know whats to come. The evening/night is spent at the St james gate pub in Banff getting nicely drunk. They have a beer menu and at least 30 beers on tap. Mike and I drove up to the Kananskis valley to go ride in the backcountry but the cloud was really low and it was a bit drizzly so we rode a fairly low rolling trail called the Terrace trail. 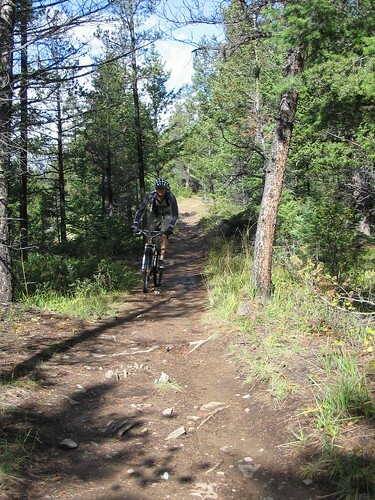 It wasn't as technical as the Rundle trail but nice singletrack none the less. The weather was perfect so we headed back to Kananskis to have a crack at Baldy Pass, a big ride up and down the other side of a big pass. We climbed for two and a half hours with the last 45 minutes being a push up in shin deep snow. The top of Baldy Pass is at over 6000ft which is one and a half times the height of Ben nevis and it certainly felt like it. The descent down the other side was excellent, the first half was a Rocky, Rooty and very technical singletrack when it wasn't covered in snow, when it was it was super technical singletrack. 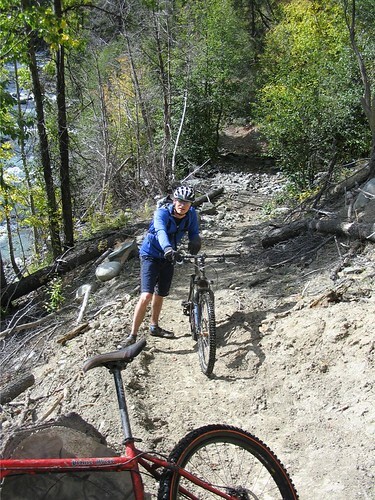 The second half was rolling, winding and buff singletrack. The whole ride including the ride back to the carpark on the road was four and half hours. Definately the best ride so far. We picked up the girls in Banff, slightly pink, and very tired. We drove up the Icefields Parkway, stopping at various points of interest on the way. The others went up onto the Glacier on what amounted to a 4x4 bus, I didn't like the idea of this and decided to explore the bottom of the glacier on foot. 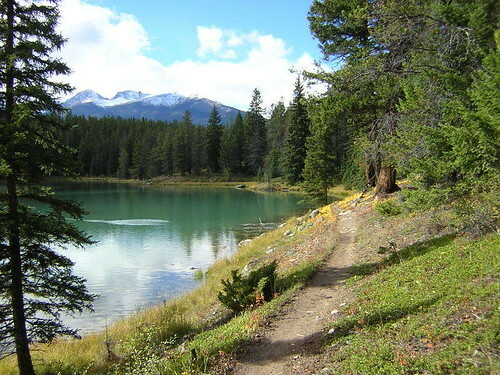 Today we got to do a ride out of Jasper, a quick trip to Freewheel Cycle in Jasper for Trail info and we were heading for the Valley of the 5 Lakes loop. It wasn't a particularly high ride but there were lots of steep climbs and descents and it was all on Singletrack. 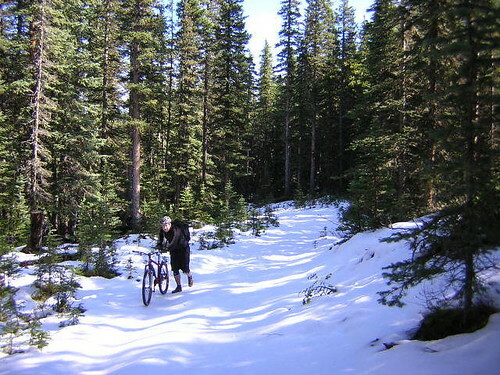 Again virtually all types of singletrack were covered and it was definately the best day for quality of riding. At one stange we road for over 100m without touching earth as we constantly on roots. The weather was beautiful too. 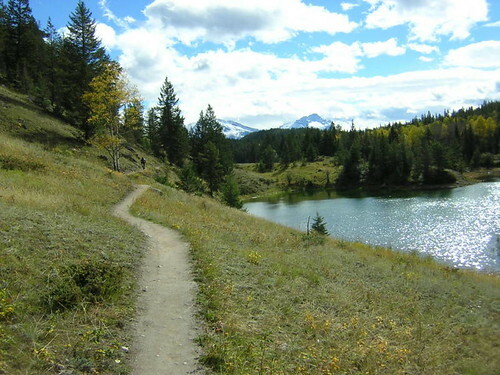 We extended the ride right down to Wabasso lake and looped back on the Road. Total time on the bike was 6 hours with a stop for lunch. Pizza makes great energy food! Another day on the road stated with coffee and sundries at the Bear Paw bakery in Jasper, we then pretty much stuck the cruise control to 100kph and kept the car between the lines. When we got to our home for the night we were greeted by huge numbers of french tourists who decided poke around our cabins as we carrying our bags into them and stuff. Apart from that Well gray Ranch was an awesome place to stay. Its a proper cowboy ranch and its cool to get a taste of the old west. After we had chucked our bags in the cabins and shooed away the frenchies we went in search of canoes. A search that was unfortunately fruitless however we walked down to the riverside and I taught Claire to skim stones, a skill that no doubt will prove useful in the next twelve months. We then walked to an observation point to watch salmon jumping and we saw a few failure to make it up the whitewater. Another day in the van with a the customary stop for Coffee and stuff at a bakery at the start of the day. Nice Peanut butter cookies from the Bakery in Clearwater! The drive was nice and easy until the final 2 hours which was either on hair raising roads or dirt tracks. We really must get a 4x4 next time we are here. We took a Float Plane from Tyaughtan lake up to Spruce Lake (it was too windy to get into Warner Lake) and rode the trails down. The takeoff was the Pilot, Dale's first dodgy one for a while apparently, but the landing was smooth. Being in the air above all that scenery was awesome too. We climbed out a bit from the back of Spruce Lake to add some distance as we were up for a long ride. It wasn't all downhill though, it was probably a 2:1 down:up ratio. 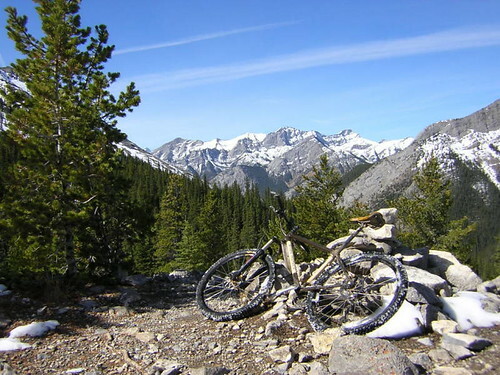 We got ride singletrack that features in the that wll known Bike flick The Collective. The trails were good but were a bit chewed up from horses. It was a good day, Float plane ride, long ride mainly downhill, lunch, top guide called Ian with knowledge of the locals trails further down. Top Day! Another 2 hours on dirt roads got us from Tyax to Pemberton then another couple on the Sea to Sky Highway back down to Van. A quick stop in MEC for stuff we decided we couldn't live without in the last two weeks. We had got a private room for all four of us booked in the HI Jericho Beach Hostel, but they screwed up and we got 2 private rooms. We went over False Crek to Downtown and got Thai Food for Tea. We had a morning in Vancouver before our flight, so Claire and went for a walk around Stanley Park, wandered down Robson for a bit, got Japanese food from our favourite restaurant in Van and then wandered around Kitsilano for a bit. Basically just chilled out. Mike and Jude did the sightseeing thing. The flight back was pretty uneventful with everyone bar Mike getting a decent amount of sleep (even me). The we were back in the UK...rubbish! Tired of working for a living Claire and I have decided to take "a year out". We want to go to places we won't necessarily get the chance to go to again, certainly not while we are this young/vaguely fit/healthy. We are heading on a tour of BC with our bikes in tow with our friends Mike and Jude. 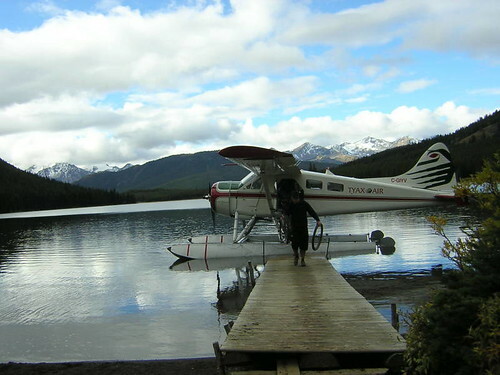 We are heading to Squamish, Kamloops, Jasper, Banff and we are heading into the skies for a float plane biking trip. 48km of mainly downhill singletrack! 4 Months in New Zealand - no real plan as yet but we intend to do some trekking. Europe - see as much of Europe in our Toyota Campervan with our bikes on the back. We will be heading to the French Alps, the Pyranees, Italy (Lake Garda), Ireland, and Scotland. We are really quite looking forward to it. Riding through a certain country park on a trail, I had a run in with Angry Dog Guy. Old guy, dogs weren't on lead. Anyway, I was riding down the trail when I saw his dogs so I slowed right down, and continued towards him. At this point he shouts "STOP" and adopts the star jump/jumping jack pose. I come to a halt trying not laugh at his aerobic impression. He's obviously abit on the angry side. ADG: You shouldn't be riding here. Dan: Well, your dogs should be on a lead. ADG: No they shouldn't , you're on a footpath, you have to give way to my dogs. Dan: I slowed down, I've never hit a dog in over 10 years cycling. Anyway shouldn't they be on a lead? ADG: They shouldn't be on a lead, they have to be under control. Dan: So how are you controlling them then? ADG: I've been a dog handler for 30 years, and I know my dogs. It says down there on the sign they have to be under control. Dan: Thats nice for you. later inspection reveils it to have a "Dog is not just for Xmas, there should be some left over for Boxing Day day" sticker in the window. ADG: I want you to read the sign and write a letter of apology and leave it on my car. ADG: I come up here for peace and quiet and you've ruined it. Dan: So do I funnily enough, shame you've spoilt my evening. ADG: But your on a footpath, you shouldn't be here. Dan: To be honest mate, i don't care if Bikes shouldn't be here or not. Dan: Can you give me one good reason why bikes can't be in the park? Dan: I can give you several scientific studies that show that feet do more damage than bikes. He walks off in a huff, his dogs having disappeared into the distance a long while ago while apparently under control. Absolutely hysterical. Now I know I that bikes shouldn't be ridden on footpaths but really what harm does it do?